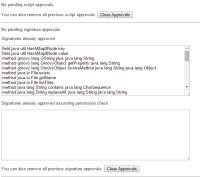 Description Larger installations may have a lot of approved signatures and the current UI only allows one to clear all signatures "Clear Approvals" (see screen shot below). It would be nice if the UI would allow one to clear individual signatures. A base example would be if the user accidentally approved System.exit but does not want that to run!